The primary goal at this time is a joint booth at Faerieworlds, though other events may also come on the radar if this starts coming together well. We've got oodles of interest so far, from people doing everything from knitting to stained glass. elocinnuala has agreed to be my business manager and is doing most of the coordination for this. Come read/join firesea_coop if interested (insert chicken joke here). Very busy. Very excited. Zoom! Hmm. 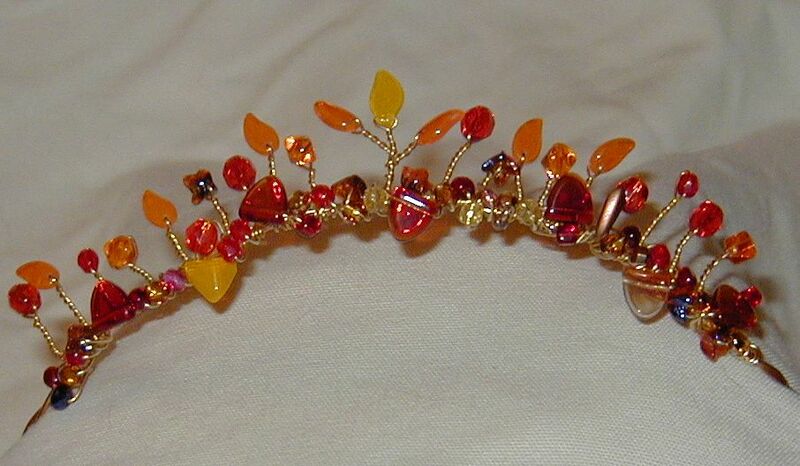 A friend and I have been making (off and on) these beaded tiara/crown thingies like spring, fire, earth ... is that the sort of thing? Those are beautiful! And I bet they'd sell like crazy at Faerieworlds. So yes, please, come join us! WANT! Especially fire. Do you ship? I'd pay for shipping? Wow! Now I, um... need to figure out where I put them. (18 month old baby = chaotic home) I'll get back to you.